Our crystal singing bowls are made of the highest quality (99.992% pure!) quartz crystal, making them incredibly resonant. The tones produced by crystal bowls are not just heard by the ear, you feel them in your body, with certain tones affecting your energy centers (chakras) for healing, balancing & meditation. Crystal Tones' crystal singing bowls are made with a unique, patented manufacturing process which is available ONLY with our bowls. This process makes our bowls strong and incredibly pure in tone. We are also committed to offering the most innovative tools that are made with intention, thus offering our clients the best sound tools available anywhere. All of our bowls are made ONLY with pure quartz crystal and the finest in gemstones and precious metals such as 24 karat gold, silver and platinum. 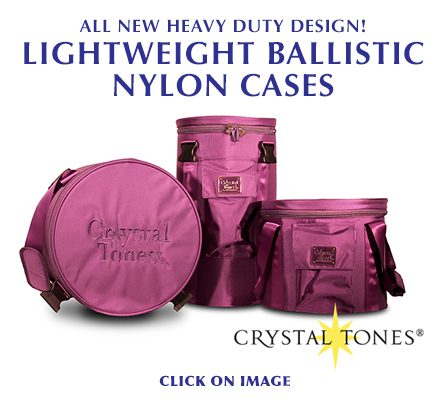 If you can't find the information you seek, please contact us by email at info@crystaltones.com or call us on our toll free number - 1-800-358-9492 (USA only) or 1-801-486-6833. Our helpful and friendly staff are always available to help you make the best selection of bowls possible, and will work with you to find the perfect tool for your needs. We feel that we offer the finest customer support available anywhere, and we think you will agree! Learn more about Crystal Singing Bowls or go directly to the Online Catalog to start your order. We also carry Crystal Singing Bowl Accessories, Crystal Singing Bowl Books and CD's, Malas, Meditation Mats, Tibetan Singing Bowls, Rock Salt Lamps and many other related products.